On Friday, December 2, 2016, Lewis Rice attorney Michael P. Davidson presented to St. Louis Area Health Lawyers Association. Mike's presentation investigated hospital payment matters, reviewed Section 603 of the Bipartisan Budget Act of 2015, explained the Final Rule, and more. Mike has a wealth of experience advising hospitals and other health care providers on all matters affecting their operations. 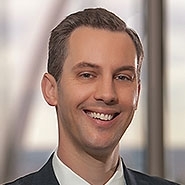 He also has a breadth of knowledge concerning structuring, negotiating, documenting, and closing health care transactions to help his clients achieve their strategic objectives. Click under "Resources" below to see the full presentation.